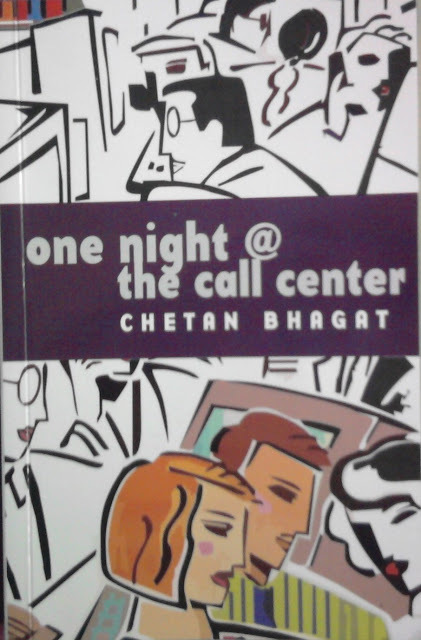 Chetan Bhagat, the best selling author of these books - Five Point Someone, 2 States, The 3 Mistakes of My Life And One Night @ The Call Center. He is an internationally proclaimed author and the best-selling English-Language novelist. Good...He pen down this book One Night @ The Call Center. And this time out of IIT/IIM, his own cocoon or territory. He reasoned it out in the prologue of this book. Believable....In this one he took the call center job and reigns it well. This book tells the story of six guys, working in a call center, same bay and coincidentally comes in the same pickup vehicle. The author took the avatar of one of the guys, named Shyam and the story is twined through him. Shyam, being a lack of confidence boy, has just missed and got his girlfriend in a cinematic climax. Vroom, passionate for cars (original man stuff) than girls, has a niche for journalism fulfilled his desire in the call center itself towards the end of the story. Esha, who ache for the modelling career, ends up in quitting that aspiration and becomes a NGO (glamorous way of fund raising). Radhika, married and succumbed to her better half's affair with another one, got out from the family entanglement. Priyanka, Shyam's once lady love, a confused gal and got her due at the end. Military Uncle, the senior in the gang, differs with his son & DIL, settled with them at last. These happy endings of each one has come after that night's phone call from God. Really the story is packed and scripted well. Shyam always thinks what the girls do for this thing or that thing and not at all thinking about his buddy Vroom's doings. Author brings out this boy thing in quite good way. Real story-like one is suddenly turns into a fictitious one when God calls the youngsters in phone,what sets everyone's life upright. The author justifies it at the last. Justification is worth and credit goes to Chetan Bhagat. This is where he gets his best selling credits, I think. The author in his first chapter commented through the character, about the English language command in this book as not highbrow and thus escaped. I had read some of the books written by Indian authors like Aravind Adiga, Shobha De, Anita Desai...so different in language command. This book fails to catch up. The author may have a view that the call center guys are not well-spoken ones. Then the effort in expressing the feelings is missing in this book. A novel must elaborate such things. Conversational dialogues which happen between the characters and the one line thoughts or comments of the main character are put down in words. Not a single emotional feeling is pen down. This is new story in one night at call center i already read some story and they are really good.